When things cool down this winter, join us for ice climbing! 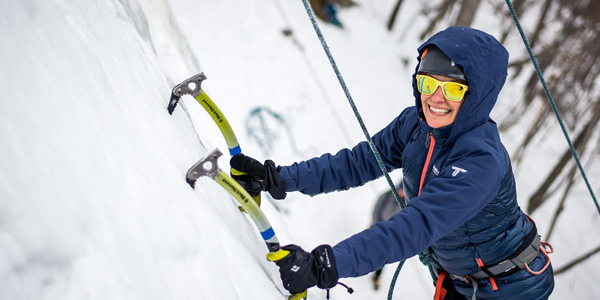 Our Intro to Ice Climbing Course allows you to safely try the sport of ice climbing on some real ice cliffs. Get out of the house and climb in the fresh air. Depending on your skill level and goals for the course, we will climb at one of a number of local cliffs in New Hampshire. We will provide some introductory instruction, teach you how to belay, and of course how to climb. Get your friends together for some fun this winter…the NEM way. [ ] Base Layer Top and Bottom: Long-sleeve wool or synthetic top will be used as your base layer. Zip-neck styles will allow for better temperature regulation. No. We will teach you everything you need to know and supervise to ensure your safety. These are boots that are designed specifically for snow and very cold weather and are crampon compatible. They are often composed of an internal insulating boot and an exterior plastic or leather boot. Hiking boots and winter snow boots are not suitable for ice climbing. Not Ready? Try your hand on Mount Washington. Still not sure? Contact Us for a recommendation.